Cleaning your gutters is one of the most important things you can do to maintain the beauty and value of your home. When gutters are full of leaves and debris they become heavy and get pulled off pitch. This can result in damage. As water overflows it leaks behind the gutter and can travel into your home. Any of these problems can be costly and time consuming to fix. Consistent maintenance is critical to keep your gutters clean. Let JG Cleaners Gutter Cleaning professionals give you peace of mind when dealing with your gutters. Have us give you a free cleaning quote. Call us at 585-414-4975 or schedule an appointment online today. JG Cleaners provides our commercial clients with safe, reliable, professional gutter cleaning services. We get the job done right and right on time. We are fully licensed and insured for commercial work and have many years of experience working in the commercial industry. We serve commercial clients in the greater Rochester and Buffalo and all surrounding areas.. Give us a call to discuss your project and your location. Call us at 585-414-4975 or schedule an appointment online right now and let the gutter professionals at JG Cleaners take care of all your gutter service needs. You will be happy you called. Looking for a professional power or pressure washing service? If you haven’t consulted JG Cleaners Gutter Cleaning Service, then you haven’t found the best cleaning service yet. 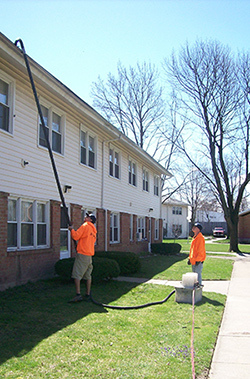 JG Cleaners Gutter Cleaning Service is an elite service provider for pressure and power washing in Rochester and Buffalo, NY. Sometimes all that is needed in your gutter repair to fix a corner or seam. JG Cleaners would be glad to come and repair your gutters and downspouts. Whether it is a leaking corner, loose gutter spikes, or unattached downspouts, you know it will be fixed right. No job is too big and is never too small. With the busy schedules of our lives, sometimes things get overlooked. Take the worry out of maintaining your gutters by counting on JG Cleaners Gutter Cleaning Service. We come automatically, so there is no need to call. A friendly postcard will announce when we will be coming to service your gutters. And best of all, we will bill you. Residential service area includes greater Rochester, NY area including the towns of: Penfield, Fairport, Pittsford, Webster, Irondequoit, Victor, Henrietta, Brighton, Macedon, Walworth, Palmyra, Honeoye Falls, East Rochester, Greece, Gates, Chili, Canandaigua, Ontario and surrounding towns. Commerical service area includes greater Rochester, Buffalo and Syracuse areas including the towns listed above and Lockport, Tonawanda, Amherst, Cheektowaga, Williamsville, West Seneca, Batavia, Seneca Falls, Baldwinsville, Geneva, Seneca Falls and surrounding towns. Sign up for our newsletter, offers & events. Stop any unnecessary, costly water damage with JG Cleaners professional gutter cleaning service. Schedule online or call us at 585-414-4975.